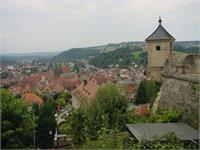 Kronach is a town in Oberfranken, Bavaria, Germany, located in the Frankenwald area. 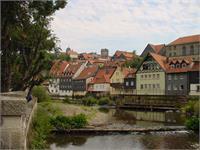 It is the capital of the district Kronach. 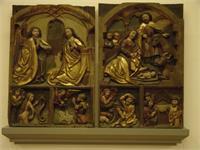 Kronach is the birthtown of Lucas Cranach the Elder. 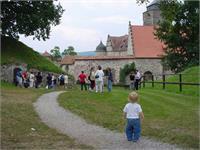 The town is equipped with a nearly complete city-wall and Germany's biggest medieval fortress (Festung Rosenberg). The rivers Haßlach, Kronach and Rodach unite in Kronach. Kronach is a picturesque town in Franconia - the "gate" to the Franconian Forest - characterized by medieval fortification walls, defiant towers and bourgeois town houses with steep gables, half-timbered or made of sandstone. For Otto I, bishop of Bamberg and founder of Kronach, the town's strategic importance was valuable, which is why a giant, pentagonal fortress wall with star-shaped angles was erected in perfect symmetrical design - the Fortress Rosenberg, bulwark of the Bamberg bishopric. Whether the Hussites, the Swedes or the Protestants - the town of Kronach, due to its solid fortifications, withstood every single attack! Despite of or rather because of its eventful past, you can visit today one of Germany's greatest fortifications that has been preserved from being destroyed. 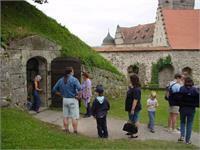 The guided tours of the Fortress Rosenberg and the Old Town of Kronach offer a rich programme that includes interesting buildings and fascinating historical details. After all, the most famous architects of the Baroque period contributed to the construction and completion of the Fortress. 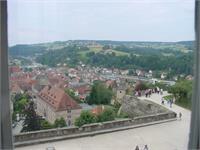 High above the old part of the town lies the former Bamberg bishop's castle at the top of the Rosenberg ("hill of roses"). 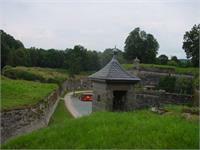 The founding of the fortress Rosenberg during the medieval period is still unknown. 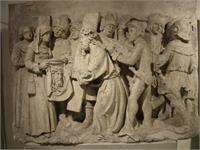 But it is certain that the oldest preserved document, which mentions the name "Rosenberg" dates back to the year 1249. 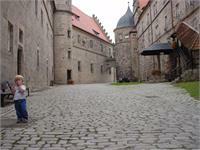 It is 23.6 hectares big and is one of Germany's greatest fortifications. The nearly symmetric and excellently built ring of forts includes a complex system of walls, moats, buildings and gates. The different phases of construction can be clearly seen beginning with the medieval Bergfried, walls and towers dating back to the 15th and 16th century to the baroque, pentagonal bastion which demonstrate the new systems of defense needed throughout the centuries. Numerous attacks, including the siege by the Swedish troops during the Thirty Years' War could not harm the fortifications. The citadel and its city can be proud of the fact that they have neither been conquered nor defeated. 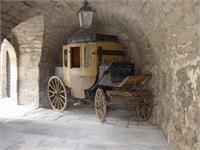 In 1888 the city purchased the fortress, which did not serve any military purpose at that time anymore. The entrance of the fortress Rosenberg is one of Germany's most beautiful baroque gates and was built in 1662 by Antonio Petrini. 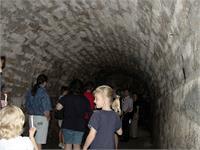 Another attraction is a complex system of underground tunnels, which can be entered with a guided tour offered at the fortress. Fortress "Feste Rosenberg", one of the biggest in the world, built in the Middle Ages, resisted three attempts of occupation in the Thirty Years War, served as headquarters of Napoleon in the Russian War, when Frankonia (as part of Bavaria) became French Allie, but was never taken. Despite being laid under siege 10 times in its history, the fortress never capitulated, even during the two year long siege during the 30 years war. 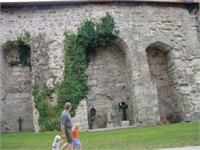 The walls were built incredibly thick so that they could withstand the barrage of 16th century cannon fire. In World War II, the fortress was a prison, where Charles de Gaulle was interned as a POW. 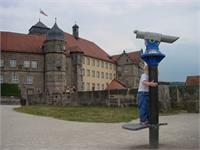 It is now used as a youth hostel; there still is a prison near the entrance; and a museum of art, featuring works by Lukas Cranach the Elder (b. Kronach), Riemenschneider and other renowned Franconian artists. Every summer, sculptors come to demonstrate their skills in the fortress's courtyard, leaving some of their works behind to enliven its otherwise somber walls.